programming — There is no spoon. This page is about my programming experience, favourite projects and books. If you're looking for some code and contributions check out my GitHub account. Writing and reading programs is my job and a passion. 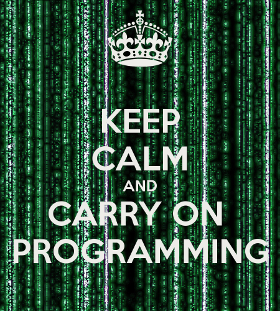 Learning new programming languages has become an addiction to me. I'm doing my best to to stay hungry and foolish. Today, I'm using mostly Node.js and PHP at work. On my spare time, I like working with Ruby, Rust, C, and many other. ViM and UNIX have become my favourite tools. On day, I started university and the computers there were using Red Hat. I liked the command line tutorial we had to do as exercices and decided to install gentoo linux at home. I was amazed - and still am - when I discovered how the Open Source community is sharing code, documentation, knowledge, and help. Not long after I decided to rent a small dedicated server, and started to learn system administration along with programming. Learning computer science is somehow unique. While just as for other skills you need a good balance between theory and practice, you can learn both all by yourself with virtually no cost but time, good documentation and an old computer. Here I would like to list some project that, in my opinion, need more visibility. They bring the fun I have with computers. i3 is a minimalist tiling windows manager. I know, that sounds familiar (there are so many of them). The reason why i3 stands out for me is because it is elegant: simple to configure yet very powerful. If, like me, VIM-like mode in your windows manager sounds like christmas , give it a try! This part is still a work in progress. I will keep a list of books I've read with some personal comments. Here is a non-exhaustive list of project I either use a lot or power my servers (in alphabetical order). Dovecot — admin-friendly IMAP/POP server. FreeBSD — FreeBSD is an advanced computer operating system used to power modern servers, desktops and embedded platforms. NSD — NSD is an authoritative only, high performance, simple and open source name server. OpenBSD — The OpenBSD project produces a FREE, multi-platform 4.4BSD-based UNIX-like operating system. Our efforts emphasize portability, standardization, correctness, proactive security and integrated cryptography. OpenSSH — OpenSSH is a FREE version of the SSH connectivity tools that technical users of the Internet rely on. Postfix — Postfix is an alternative to the widely-used Sendmail program. PostgreSQL — PostgreSQL is a powerful, open source object-relational database system. Ruby — A dynamic, open source programming language with a focus on simplicity and productivity. It has an elegant syntax that is natural to read and easy to write. Unbound — Unbound is a validating, recursive, and caching DNS resolver. ViM — Vim is an advanced text editor that seeks to provide the power of the de-facto Unix editor 'Vi', with a more complete feature set. clang — The goal of the Clang project is to create a new C, C++, Objective C and Objective C++ front-end for the LLVM compiler. bhyve — bhyve, the "BSD hypervisor" is a hypervisor/virtual machine manager developed on FreeBSD and relies on modern CPU features such as Extended Page Tables (EPT) and VirtIO network and storage drivers. nginx — nginx [engine x] is an HTTP and reverse proxy server, as well as a mail proxy server, written by Igor Sysoev.